Stefan Ampenberger was born in 1908 in Munich Germany. 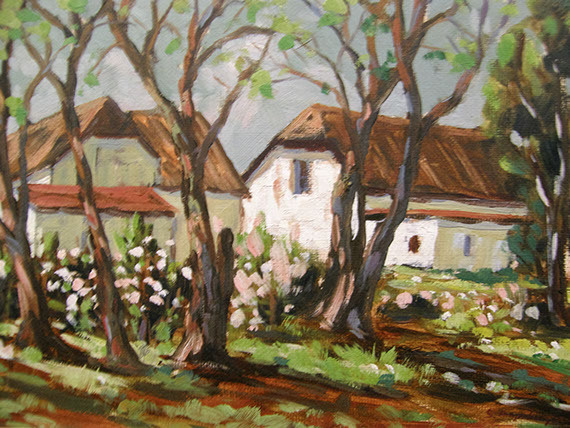 He began painting at a very young age at home in Bavaria. When they settle in South Africa in 1926, Stefan met JH Amschewitz in Johannesburg, where he received guidance. He travelled the countryside by caravan for 17 years, sketching and exhibiting alongside his wife, Iris Ampenberger. In 1964 he finally settled in Thaba ‘Nchu. Ampenberger is mainly a painter of landscapes, occasionally figures included, Working in watercolor and oil. Stefan was a guest member of the Bloemfontein Group and exhibited with them on some occasions. In 1980 Stefan Ampenberger lost use of his legs through illness, but continued active life and painting from a wheel-chair. Stephan passed away in 1983.